Today is an important historical moment for Cambodia as the Royal Government of the Third legislature of the National Assembly meets in its first full session. As Head of the Royal Government, may I extend my warmest welcome to Your Highness Sdech Krom Khun, Your Highnesses, Excellencies and colleagues in the Royal Government of the third legislature of the National Assembly. According to the past practice of assuming functions in a new Government, the First Cabinet Meeting (FCM) provides an opportunity to address to all Cambodian people and international partners the policy priorities of the Royal Government of the new legislature, and the strong commitment of the Royal Government to successfully achieving all these priorities, in order to serve the best interests of the nation and respond to the aspirations and needs of Cambodian citizens, who have cast their votes of confidence in the Royal Government through the democratic, free, and fair general elections. Therefore, may I propose to today’s Cabinet Meeting to start working in the spirit of this good tradition. As I have reiterated on many occasion at the national and international fora, I am strongly convinced that Cambodia has no choice, but continuing to seriously implement comprehensive and deepening reform programs. Reform is the life and death issue for Cambodia. Only if we jointly carry out reforms, then we will be able to get rid of the vicious cycle of poverty and bolster up a once strong and proud nation to get back its place. On the contrary, if we avoid carrying out reforms we will certainly miss the chance and opportunity, and the momentum that we are having today, and our people will continue to mire in poverty, endless conflict and instability. The people of the Kingdom of Cambodia expressed their collective will on 27 July 2003, through the general elections recognized by national and international observers as free, fair, transparent, and credible. The Royal Government of Cambodia has taken office in the third legislature of the National Assembly, humbled by the people’s will and fully committed to peace and national reconciliation, stability and social order, democracy and respect for human rights, national independence, sovereignty and territorial integrity, and sustainable development that will establish progress, prosperity, harmony, decent livelihood and dignity for Cambodians from all walks of life and the entire nation. The over-riding goal of the Royal Government of Cambodia during the third legislature of the National Assembly is to firmly and steadily build Cambodian society by strengthening peace, stability and social order, entrenching democracy, promoting respect for human rights and dignity, ensuring sustainable and equitable development, and strengthening Cambodia’s social fabric to ensure that the Cambodian people are well-educated, culturally advanced, engaged in dignified livelihood and living in harmony in family and society. The Royal Government of Cambodia stands fully committed to the policy of national solidarity and the mobilization of national strength contributed by all sectors and all political affiliations both domestic and international, harmonized under the motto of “Nation, Religion, King,” and thereby unified as one to build and defend the nation and protect the achievements of the Kingdom of Cambodia in the context of national independence, sovereignty, territorial integrity, peace, democracy and progress as guided the wisdom and leadership of His Majesty Norodom Sihanouk, King of Cambodia and Her Majesty Queen Norodom Monineath Sihanouk. In its second term from 1998-2003, having scrupulously implemented the Triangle Strategy, the Royal Government of Cambodia succeeded to ensure a favorable environment and the sine qua non conditions, both internally and externally, for Cambodia to move forward, with strong hope and confidence on the path of reforms and sustainable development. The success of the Royal Government in implementing its “win-win” policy has enabled the profound transformation of Cambodia from a region of uncertainty, war, internal strife, instability and backwardness into an epicenter of sustained peace, security and social order, respect for democracy, human rights and dignity, cooperation and shared development. Over a very short period relative to the long histories of many developed countries, the Royal Government has demonstrated that Cambodia is fully capable of engagement on an equal footing with all partners, in regional and international affairs. The positive gains so far achieved have bolstered confidence in Cambodia’s bright future, shoring up the foundations for dynamic enterprise, increased trade, investment flows and tourism that will generate employment and incomes for Cambodians, thereby reducing poverty and improving the well-being of our people. At the forefront of the political agenda of the Royal Government in the third legislature of the National Assembly are the: (a) promotion of economic growth; (b) generation of employment for all Cambodian workers; (c) implementation of the Governance Action Plan and thereby ensuring equity and social justice; and (d) enhancing efficiency and effectiveness of the Royal Government in implementing the reform programs in all sectors to reduce poverty and achieve sustainable development. In this regard, as head of the Royal Government, I would like to set out the Rectangular Strategy as a supporting tool to implement the political platform of the Royal Government in the third legislature of the National Assembly, to attain poverty reduction, development, progress, prosperity, national harmony and happiness of the Cambodian people. First, the Rectangular Strategy is set out to ensure the continuity and to further strengthen the achievements attained in the second legislature of the National Assembly through the implementation of the Triangular Strategy. The Rectangular Strategy selects key elements from the Millennium Development Goals, the Cambodia Socio-Economic Development Program 2001-2005 (SEDP2), the Cambodia National Poverty Reduction Strategy 2003-2005(NPRS), and the various policies, strategies, plans and other important reform programs, all of which have been formulated through broad consultation with all national and international stakeholders – including government ministries and institutions, representatives of civil society and the donor community, with an objective of improving and building capacity of public institutions, strengthening good governance, and modernizing national economic infrastructure that will help to promote economic growth, generate employment for all citizens, ensure social equity, enhance efficiency of the public sector and protect the nation’s natural resources and cultural heritage. All of these are crucial for promoting sustainable development and poverty reduction. Third, the political platform of the Royal Government in the third legislature of the National Assembly has been finalized upon the unanimous agreement between the two coalition partners in the Royal Government. Thus each and every key element of the economic policy of this political program has been revisited, screened and streamlined into the rectangular strategy by highlighting and interweaving the priority policy measures in a systematic and mutually-reinforcing fashion. Therefore, the rectangular strategy is the successor of the Triangular Strategy of the Royal Government in the second legislature of the National Assembly, and thereby establishes the key facets of the Royal Government of Cambodia’s development strategy for the third legislature of the National Assembly. Geometrically, the Triangular Strategy clearly demonstrated its capacity to withstand strong challenges and adversity, remaining stable and unbowed in any circumstance. Therefore, the rectangular strategy may be depicted as an integrated structure of interlocking rectangles that represent sustainability and stability in the same way as a strong table or chair firmly stands on four pillars. Indeed, the successful implementation of the Rectangular Strategy shall ensure national stability and sustainable development in Cambodia. On the other hand, the rectangular strategy constitutes the Economic Policy Agenda of the Political Platform of the Royal Government in the third legislature of the National Assembly. The rectangular strategy has been formulated and prepared by screening, highlighting and streamlining the reform programs into a comprehensive, systematic, intertwined, mutually-reinforcing package of priorities that is easily understood and thus serving as a key tool for the Royal Government and its development partners to implement and manage the economic policy agenda of the nation. The rectangular strategy aims to promote economic growth, full employment for Cambodian workers, equity and social justice, and enhance efficiency of the public sector through the implementation of the Governance Action Plan and in-depth reforms that are coordinated and consistent across all levels and sectors. Thus, the Royal Government in the third legislature of the National Assembly shall the “Government of Growth, Employment, Equity and Efficiency”. Second, the overall environment for the implementation of the rectangular strategy consists of four elements: (1) peace, political stability and social order; (2) partnership in development with all stakeholders, including the private sector, donor community and civil society; (3) favorable economic and financial environment; and (4) the integration of Cambodia into the region and the world. Third, the four strategic “growth rectangles” are: (1) enhancement of agricultrual sector; (2) private secter development and employment generation; (3) continued rehabilitation and construction of physical infrastructure, and (4) capacity building and human resource development. 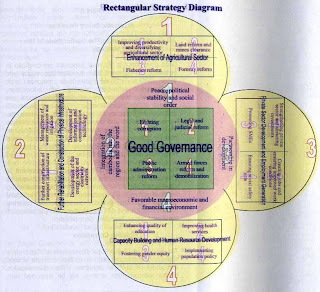 · Rectangle 1: Enhancement of Agricultural Sector which covers: (1) improved productivity and diversification of agriculture; (2) land reform and clearing of mines; (3) fisheries reform; and (4) forestry reform. · Rectangle 2: Further Rehabilitation and Construction of Physical Infrastructure, involving: (1) further restoration and construction transport infrastructure (inland, marine and air transport); (2) management of water resources and irrigation; (3) development of energy and power grids, and (4) development of information and communication technology. · Rectangle 4: Capacity Building and Human Resource Development, including: (1) enhanced quality of education; (2) improvement of health services; (3) fostering gender equity, and (4) implementation of population policy. Good governance is the most important pre-condition to economic development with sustainability, equity and social justice. Good governance requires a wide participation, enhanced sharing of information, accountability, transparency, equality, inclusiveness and the rule of law. In this regard, good governance will ensure that corruption be reduced to the minimum, the view of minorities and the voices of the most vulnerable in society be fully heard and considered in decision-making processes. Indeed, the attainment of good governance is crucial to the poorer functioning of society both in the present and the future. To achieve good governance, the Royal Government of Cambodia will focus on the effective implementation of its Governance Action Plan which covers four crosscutting areas of reforms: (i) combating corruption, (ii) judicial and legal reform, (iii) civil service reform covering decentralization and de-concentration, and (iv) reform of the armed forces, especially demobilization. The key thrust of the Royal Government of Cambodia’s strategy to fight corruption is to take concrete actions that attack the roots of corruption. The implementation of the anti-corruption strategy will be supported with enough tools and resources to prevent and to substantially crack down on corrupt entities. Implementation is crucial because laws, regulations and codes of conduct are not sufficient to successfully fight corruption. Indeed, there must be efforts and mechanisms to strengthen the effectiveness of law enforcement. In fighting corruption, the Royal Government of Cambodia will, as soon as possible, ensure the adoption of the Anti-corruption Law and create an independent body to fight corruption. The Royal Government will also promote effectiveness, transparency and accountability in the management of public finances, especially through the strengthening of audit processes and public procurement. The Royal Government shall also promote the implementation of the multi and cross-sectoral governance reforms, especially those guided Governance Action Plan, which has been developed with broad participation from various government ministries and institutions, civil society and development partners. From this 3rd legislation onwards, the Royal Government of Cambodia will enable the responsible ministries and institutions to review and check on the commercial contracts and concession agreements on natural resources and state assets. The Royal Government of Cambodia will respect and promote the independence and neutrality of the judicial system as stated in the Constitution and thus the independence of the Supreme Council of the Magistracy shall be vigorously upheld and protected. The Royal Government will promote legal and judicial reforms and ensure the independence of the court system through the implementation of key policies and strategies developed by the Council of Legal and Judicial Reform, thereby enhancing the confidence of the national and international community, and closely cooperating with development partners to strengthen the rule of law, promote social justice, reduce corruption, eliminate the culture of impunity, and strengthen the culture of peace and the primacy of law. The Royal Government will prepare priority action programs and projects that will steadily reform the judicial and legal system, focusing on the finalization and submission to the National Assembly of draft basic laws such as the Statue of Judges, the Law on Organization of the Court, the Criminal Code, the Law on Criminal Procedures, the Civil Code, the Law on Civil Procedures, the Law on the Organization and Functioning of Notaries Public, and the Law on the Organization and Functioning of Bailiffs. Other laws and regulations are also necessary to complete the legal framework required for Cambodia’s full international engagement, especially within the context of the ASEAN ad the World Trade Organization. More importantly, the Royal Government will establish special courts as needed, such as the Commercial Tribunal, the Juvenile Tribunal, the Labor Tribunal, and the Administrative Tribunal. Moreover, pilot courts will be gradually introduced to enhance the quality and effectiveness of judicial services. Also priority is the enhancement of the capacity and responsibility of judges through the enforcement of the Statute of Judges, improved discipline through the enforcement of the code of conduct and through continuing training. The Royal Government will establish institutions for the training of court clerks, bailiffs and notaries. We will provide training and improve management of the judicial police. Furthermore, attention will also be directed to the provision of legal aid (including pro-bono legal professional services) to the poor who require legal and judicial protection and assistance. Finally, the Royal Government will enhance mechanisms for conflict resolution outside of the court system, particularly in the settlement of disputes related to the ownership and property rights of unregistered lands. The Royal Government recognizes that the strengthening of industrial capacity is crucial to sustainable development. The administrative system and the civil service must be neutral, transparent, professional, responsive and responsible. The Royal Government has adopted the National Program for Administrative Reform to transform the administration and civil service into an effective organization for the successful implementation of the Government’s political platform. Consistent with this thrust, the Royal Government will focus on delivering public services to the people with quality and effectiveness in four priority areas: (1) services related to the sovereignty of the state (including vital records, permits and land registration titles), (2) services related to investments, (3) basic services, especially education and health, and (4) services related to revenues collection and expenditure of the state. The provision of public services will be facilitated and simplified through the elimination of overlapping work, streamlining the bureaucracy, implementation of decentralization and de-concentration at the commune level, establishment of a “single window” for services applications and the opening of a citizen’s office. These procedures will be gradually computerized to improve transparency and reduce corruption. Special attention shall be focused on the management of civil servants to move the public administration closer to the people consistent with decentralization and de-concentration and the transfer of authority from upper to lower levels of the bureaucracy. This measure shall be facilitated by the clear definition of the roles, powers and responsibilities of the various authorities at the levels of the province, city, district and commune, as well as the introduction of information technology. The process to rationalize the civil service shall be continued to gradually raise the salaries of all civil servants by 10 to 15 per cent per year to improve their living standards to an appropriate and dignified level. The Royal Government recognizes that the implementation of decentralization to the commune is crucial to the strengthening of democracy at the grassroots level, improving the quality of public services and participatory local development in all sectors. A key priority in local governance is to build local management capacity, provide reasonable levels of financial resources to the communes and promote the culture of participation. Indeed, decentralization must be implemented in conjunction with de-concentration to build capacity at the municipal, provincial, and district levels, and thereby ensure harmonized and mutually-supportive and complimentary operations with and among the grassroots-level communities. Therefore the Royal Government will proceed, as soon as possible, with the appointment of village chiefs, deputy village chiefs and the members of the village committees in accordance with the principles of decentralization at the commune level. The Royal Government will continue to implement the policy and programs identified in the White Book of National Defense of the Royal Cambodian Armed Forces, including the distribution of social concession lands to the demobilized landless soldiers who request for land for their residences and/or for family farming in conformity with the Sub-decree on Social Concessions. The Royal Government will continue to reform, build and strengthen the national police into a professional force, equipped with modern technology, and capable of discharging its responsibilities with due respect for law and human rights, thereby enabling the police to serve the people, maintain security, social order and harmony and protect the people’s safety and property. Peace, political stability and social order constitute the most important conditions for strengthening macro-economic stability and promoting sustainable development and poverty reduction. Therefore, the Royal Government will continue to further strengthen peace, political stability and social order, reflecting the nation’s decisive move towards development and prosperity, leaving behind the legacy of wars, genocide and internal strife that have destroyed Cambodia over the past three decades. Peace, political stability and social order are crucial for building the state and implementing state reform. Therefore, the top priority of the Government is by all means to strengthen the fabric of peace. Moreover, the strengthening of peace, political stability, and social order will promote a “credible image” of Cambodia, build the confidence of investors and tourists in the country and generate favorable conditions for the people’s dignified livelihoods that significantly contribute to economic development. The Royal Government considers as a top priority the strengthening of partnerships with all development partners, including the donor community, the private sector and civil society. The mechanism of partnership with the donor community shall be established consistent with the Resolution of the General Assembly of the United Nations, the principles of the Organization for Economic Cooperation and Development – Development Assistance Committee, as well as the initiatives of the Word Bank and the United Nations Development Program. The Royal Government considers the private sector as an engine of growth. Therefore, the strengthening of partnerships between the Government and private sector must be harmonious, allowing for rationalized interventions focused on development and the strict enforcement of laws and regulations, with the effective support and facilitation by the relevant Government agencies. Therefore, the “Government-Private Sector Forum” will be further strengthened to enhance its effectiveness as a mechanism of partnership between the public and private sectors. The Royal Government continues to strengthen cooperation between the state and civil society based upon the rule of law to enhance democracy, freedom, social order and the primacy of law. Civil society shall become an effective partner of the Government in nation building. To this end The Royal Government will encourage the activities of the non-governmental organizations and other duly-registered associations. Working to serve and benefit the people and the nation. The Royal Government welcomes the participation of NGOs in the process of socio-economic rehabilitation and development and the promotion of democracy and respect of human rights. In this regard, The Royal Government will speed up the drafting, adoption and i9mplementation of the Law on Non-Governmental Organizations, with broad consultation with all relevant institutions and organizations. Building on its achievements in macroeconomic and fiscal management, the Royal Government will endeavor to achieve economic growth in the order of 6 to 7 per cent per year, maintain low inflation to a single digit, keep the exchange rate stable and increase international reserves. The Royal Government will maintain a prudent monetary policy, including a market-based exchange rate. The policy of de-dollarization will be cautiously continued, reflecting the development of the domestic and international economies. The maintenance of strict budget discipline is crucial to ensure a favorable macroeconomic and financial environment to consolidate the foundation for sustainable and equitable economic growth. The Royal Government is committed to improve the collection taxes and non-tax revenues, including the strict implementation of the Law on Taxation, the reduction of corruption and tax evasion, dismantling of the culture of tax exemptions, broadening the tax base, strengthen tax and customs administration, and the strict management of state assets including tangible and intangible properties, as well as state enterprises and joint-ventures. The Royal Government will further implement reforms in public financial management, especially by rationalizing expenditures based on the principles of transparency, accountability and economic efficiency and improving audit and public procurement, according priority to social and economic expenditures and public investment especially physical infrastructure. Budget operations, on both the revenue and expenditure side, shall be executed in accordance with established norms and procedures. Discipline 10: take serious strides to strengthen the management of all forms of state assets by fully enforcing the laws and regulations related to state asset management. The Royal Government is conscious that increasing domestic savings is crucial for the long-term economic development of Cambodia. Thus the Royal Government will continue to implement measures to strengthen the domestic banking system by improving management, strengthen bank supervision and surveillance and enhancing the mobilization of savings to finance private investment projects and thereby promote economic growth. The Royal Government will continue to strengthen the rural finance sector to enhance financial services including low-interest loans within the framework of the market economy, considering the experiences of other ASEAN countries in the provision of financial services to the poor, low-income families and small and medium enterprises that promote rural development and raise living standards in rural and remote areas. Moreover, the Royal Government will take serious steps to develop laws , regulations and capacity of institutions in the mobilization of domestic resources through continuously reforming and improving the tax system, strengthening commercial banks and the insurance sector, and establishing a capital market consistent with Cambodia’s Vision and Plan for Financial Sector Development for 2001-2010, developed with the technical assistance from Asian Development Bank and adopted by the Government in August 2001. The Royal Government will continue to push for the integration of Cambodia into the region and the world, specifically focusing on bridging the development gaps among member-countries of the Association of South East Asian Nations by promoting full partnership in the implementation of the various elements of the Initiatives for ASEAN Integration as adopted by the ASEAN Summits, in particular the measures and projects adopted by the 8th Summit in November 2002 in Phnom Penh. The Royal Government will also continue its active participation in the implementation of Greater Mekong Sub-region Program, especially the flagship programs adopted by the 1st Summit of Greater Mekong Sub-region Program in Phnom Penh in November 2002 and the projects under “the Development Triangle Zones” between Cambodia, Viet Nam and Lao PDR and “the Development Triangle Zones” between Cambodia, Lao PDR and Thailand, and “the Economic Cooperation Strategy” among Cambodia, Lao PDR, Thailand, and Myanmar. To maximize the gains from international integration, Cambodia must strengthen its institutional capacity to implement cooperative strategies with neighboring countries such as the concept of “Four Countries-One Economy”, the creation of the triangles for economic growth and the establishment of cross-border Economic Processing Zones. There is worldwide recognition that free trade significantly contributes to the reduction of poverty and improvement of the living standards of the people. Thus the Royal Government will continue to liberalize trade and ensure free flow of goods and services both within the country and between Cambodia and other key partners in the region and the world. Increasing the unfettered access of Cambodian products to the regional and world markets will provide Cambodia with the economy of scales and opportunities that attract investment, create employment, generate increased incomes and accelerated economic growth that result in poverty reduction. Indeed, Cambodia’s participation in the ASEAN Free Trade Area and accession to the World Trade Organization (WTO) constitute strategic and historical steps in the rehabilitation and development of Cambodia. The Royal Government will strictly implement its obligations under the World Trade Organization, recognizing that Cambodia’s membership in the WTO requires great efforts in the formulation, adoption and the implementation of laws, regulations, procedures, and methodology for valuation, assessment report on the effects of trade protection, studies on rice production and agricultural markets, agricultural value chain analysis, handicrafts, pure drinking water, fisheries, factories, tourism and other labor services that Cambodia can benefit from WTO. The Royal Government is strongly committed to using this opportunity to embark on reforms in all sectors. In the last legislature, the Royal Government successfully promoted economic growth. However, the economic growth of Cambodia has been narrowly based, largely upon garments and tourism and rendering the economy relatively vulnerable to external shocks. Indeed it is necessary to enhance and broaden the base for economic growth by opening and utilizing the potentials in other sectors, especially in the high potential agricultural and agro-industrial sectors, so that the nation will obtain larger positive windfall gains in the improvement of the livelihoods of the rural people. The agriculture policy of the Royal Government is to improve agricultural productivity and diversification, thereby enabling the agricultural sector to serve as the dynamic driving force for economic growth and poverty reduction. Thus the Royal Government will invest substantial domestic resources to promote agricultural intensification and diversification to bolster economic growth, create employment and generate income in the rural areas, thus ensuring nutritional improvement, food security and increased agricultural exports. In this regard, shifting the direction from “expansionary” or extensive” agriculture to “deepening” or “intensive” agriculture especially by increasing the yields using the existing land through intensification has become the top priority of the Royal Government. The Royal Government will create a favorable environment conducive to private sector participation in the agriculture sector enterprise by accelerating the distribution of land and the issuance of secure land titles within the framework of social land concessions, particularly in the rural areas. The Royal Government shall also ensure the development of irrigation facilities and water resource management by improving productivity of the existing irrigation systems, further creating and enhancing quality of water user communities and as well as reducing vulnerability to natural disasters. To increase agricultural productivity, the Royal Government will put more emphasis on expanding support services such as agricultural research and extension, development of markets for agricultural product, distribution of inputs, seeds, fertilizer and the increased supply of rural credit. The Royal Government will accord special emphasis on directing public investment and encouraging private investment in agriculture to increase agricultural production while ensuring that the quality of Cambodian agricultural products are improved toward international standards. The Royal Government will continue to accord priority to the development of border and remote areas to control migration, and also focus on the development of township centers adequately equipped with infrastructure that facilitate resident’s livelihood and local economic activities. The Royal Government will continue to promote the “one-village one-product” movement to encourage creativity and confidence of the rural people by adopting four principles: (1) encouraging modes of production suited to village contexts and market needs, (2) facilitating and encouraging appropriate market identification, financing, technology transfer and inputs supply, (3) provision of human resource development and training in management, and (4) facilitating the creation of agricultural communities to enable stable and remunerative product prices. Land and water are the two fundamental natural resources that serve as the basis for socio-economic development and poverty reduction, especially in the rural areas. The Royal Government will continue to implement the Law on Land Management and land policy to strengthen an equitable and efficient system of land management, distribution and utilization, including land restoration and distribution, land tenure security, eradication of illegal settlements and land grabbing, and the control of land ownership concentration for speculative purposes. The Royal Government will review idle and vacant State lands, as well as State land illegally occupied by private entities in contravention with the regulations and procedures. The Royal Government will continue to accord priority to the strengthening of land tenure rights of the people who need small lots for settlement and family production within the social land concession framework, as a mechanism to assist poor households and vulnerable groups. The Royal Government is aware that de-mining is not only a security-related issue but also has significant economic implications, particularly on land distribution and the security of poor faming households in remote areas. Thus the Royal Government will guide the implementation of de-mining in Cambodia in accordance with international security standards and international obligations to ensure safe, well-coordinated implementation of the national de-mining plan. Fish is crucial to the lives of million of Cambodians in terms of food, income and livelihoods. Fish and rice enable food security, contributing three-quarters of protein supplies to more that two million people. The Royal Government has enabled the community based development of the fisheries sector by empowering local communities so that farmers can participate directly, actively and equitably in fishery plans, programs and management. The Royal Government will transform some of the fishing lots whose concession contracts have expired into fish sanctuaries, thereby helping increase natural fish stocks, and conserve endangered species. Community-based fishing lots will be expanded and aquaculture promoted to respond to the increasing needs for fish as well as reduce the pressure on fisheries resources. The Royal Government has reviewed the remaining forest concessions, cancelled many concessions found violating the agreement, and evaluated the concession system to ensure efficient management. The Royal Government will also continue to promote reforestation. Transportation networks are the arteries that connect all corners of the Kingdom of Cambodia and thereby transform the country into tan integrated economy. The transport networks are instrumental in integrating domestic markets and facilitating Cambodia’s integration into the regional and world economies. Moreover, physical infrastructure plays a pivotal role as the “locomotive of economic growth,” significantly contributing to poverty reduction and the alleviation of the people’s hardships. Thus, the Royal Government will continue to accord high priority to the rehabilitation and reconstruction of transportation networks, including bridges, roads, railroads, seaports, and airports that link all parts of the country and link Cambodia to neighboring countries and the rest of the world. The objective is to create a convenient, comprehensive, safe, effective and price-efficient transport network that facilitates trade, promotes tourism and rural development and ensure Cambodia’s economic integration into the region and into the world, while especially serving the interests of national defense. Therefore high priority will be given to the further building of rural roads, coupled with measures on road maintenance to ensure continuing transport services and travel safety. The Royal Government will further its efforts in the rehabilitating and developing railroads and promoting rail transport of bulk and heavy goods. Civil aviation will be further enhanced to ensure the significant contribution civil aviation services to economic growth, especially in boosting tourism. The national policy on water resources and irrigation is a part of broad program to protect, manage and assure sustainable exploitation of both fresh water and marine resources while enhancing bio-diversity and sustainability for equitable benefit to the public. The objectives are to anticipate and prepare ourselves to meet the growing challenges facing Cambodia’s water resources in the next 20 years by adopting relevant measures. Thus the Royal Government will focus on: (1) providing all citizens with clean and safe water; (2) protecting all citizens from water-related diseases; (3) providing adequate water supply to ensure food security, economic activities and appropriate living standards; and (4) ensuring water resources and an environment free from toxic elements, while enabling a supportive fisheries and ecological system. The Royal Government will develop and expand irrigated lands and effective water resources management by improving the efficiency o0f the existing irrigation system, further developing and enhancing the effectiveness of water communities and reducing the vulnerability of the population to natural disasters and its total dependence on natural conditions. One of the most important aspects of the Royal Government’s economic policy is the further development of the energy sector to effectively respond to the increasing needs for low-cost electricity. Thus the Royal Government places high priority on attracting private sector investment and participation in electricity production and distribution, especially in key provincial and urban centers, as well as investment in rural electrification to provide the rural areas with quality and low-cost electricity. The Royal Government will also support the establishment of power transmission grids linking Cambodia with neighboring countries. The rehabilitation and expansion of electricity generation and distribution in Phnom Penh will be further continued with the imports of electricity from neighboring countries and the construction of as thermal power plant in the coastal zone. The Royal Government plans to install power generating plants in Kamchay, Stung Battambang, Stung Atay, and Stung Russeychrum. In developing hydro power resources, the Royal Government will carefully analyze all aspects involved, especially its economic benefits and environmental and social impacts. · Expanding radio and TV broadcast networks to improve efficiency and to facilitate information ands postal service. The Royal Government is committed, within the next five years, to comprehensively establish and expand the telephone network in Phnom Penh and install microwave or optical fiber cable communications to connect: (1) Kompong Cham – Phnom Penh – Takeo – Kompot – Sihanoukville; (2) Kompong Cham – Kompong Thom – Siemreap – Sisophon; (3) Kompong Cham – Kratie – Stung Treng; (4) Mondulkiri – Pailin – Preah Vihear – Oddor Meanchey. The Royal Government will enhance the implementation of an open policy in promoting private sector participation in information and telecommunication technology without discrimination, consistent with Cambodia’s commitments and obligations as a member of the WTO. The Royal Government considers the private sector as the engine of economic growth, while the Government plays its role as the strategist in creating an environment conducive to enhance private enterprise and the manager of development process. A healthy private sector is the key to the promotion of economic development and the Royal Government will continue its efforts to access the international markets through: (i) implementation of policy of economic integration of Cambodia into the regional and world economy; (ii) development of both software and hardware national infrastructure networks; (3) strengthening of the legal framework for enterprise, including laws, regulations and institutional capacity that facilitates business, trade and private investment, especially fair competition, transparency, accountability and fruitful partnership between private and public sectors. A particular priority of the third legislature is the preparation of measures that enable the environment conducive to private sector development through concrete measures which aim at: (i) strengthening both public and corporate governance; (ii) facilitating trade and improving the climate for investment, and (iii) promoting human resource development to effectively respond to market needs. The Royal Government has committed itself to the promotion of SMEs through the following policies: (i) encourage the development of SMEs, especially through the provision of medium and long-term finance; (ii) suppress smuggling; (iii) reduce registration procedures and start-up process for companies; (iv) facilitate export-import activities by simplifying procedures such as licensing and other letters of permission; (v) support for newly –established industries for an appropriate period; (vi) promote linkage between SMEs and large enterprises; (vii) establish a national center for productivity to assist SMEs enhanced their productivity and reduce production costs; (viii) establish a national standards institution to help ensure the quality of domestic products to meet regional and international standards, (ix) establish national laboratories for physics, chemistry, micro-biology, mechanics and tests for quality and criteria of products; (x) strengthen mechanisms for the protection of industrial intellectual property rights, to prevent illegal copying, recreation and illegal use of new techniques and technology; (xi) promote vocational/skills training, both domestic and overseas; (xii) expand and accelerate the “one-village one-product” program; and (xiii) strengthen the legal framework by creating laws on concerns such as: factories, industrial zones, patents and inventions, measurements and industrial safety. The Royal Government will implement a systematic policy aimed at: (i) creating more jobs, especially for young people entering the labor market, and for all Cambodian laborers through various measures which encourage domestic investment and attract foreign direct investment in priority sectors, especially agriculture, agro-industry, labor intensive industries and tourism; (ii) establishing skills training networks for the poor, linked to employment assistance especially for young people and new graduates in response to labor market needs; and (iii) developing a labor statistical system. More attention will be focused on improving the management of foreign workers in Cambodia to create jobs for Cambodian citizens and facilitate the transfer of new technology for national development. Employment and training policy and programs will include opportunities for job mobility, information technology and vocational/skill training, while effectively linked to education policy. The export of workers provides another important option for poverty reduction, as seen in the experience of neighboring countries. The Royal Government encourages official labor exports to increase welfare, improve capacity, reduce unemployment, and increase revenue. Investment in urban areas is the important policy tool to support the poor if the investment generates productive employment to absorb the inflow of surplus laborers from the rural areas. Growth in labor-intensive industries, such as garments, generates a strong foundation for increased per capita incomes and thereby reduces poverty. Moreover, the development of labor-intensive manufacturing has helped to absorb rural labor and promote income generation, therefore making contribution to the reduction of rural poverty. The Royal Government has introduced programs to increase agricultural productivity to increase the quantity of agricultural products and thereby generate increased incomes and improved living standards, particularly through job creation via agricultural intensification and diversification. This approach is clearly superior to overt mechanization that reduces jobs for farmers. The strategy for accelerated growth in agricultural products will have important cross-sectoral multiplier effects through increased demand for goods and services. Through enhanced cooperation with national and international organizations, the Royal Government will increase its social sector interventions, thereby improving employment opportunities, reducing vulnerability of the poor, enhanced emergency assistance to victims of natural disasters and calamities, and expanded rehabilitation programs for the disabled, including welfare improvement programs for the elderly, orphans, female victims, the homeless, and the veteran and their families. The Royal Government continues to support the disabled people and veterans and their families, especially those who have sacrificed their lives for the country. The Government will encourage owners of enterprises and factories to provide fair wages and gradually introduce pension schemes for workers in accordance with market conditions. The Royal Government will seriously enforce the Labor Law and other international conventions related the role of trade unions in order to ensure the rights and benefits of workers, employees and employers. The Royal Government will put special priority on improving the working conditions of workers and employees, enhance the implementation of the Law on Social Security, encourage the implementation of pension funds especially pensions for disability and dependents, and insurance for work accidents as stipulated in the Labor Law. The Royal Government has set out a comprehensive strategy on education, as expressed in detail in the Education Sector Support Program for 2001-2005. The strategy aims to enhance capacity of human resources with high technical and scientific skills that effectively respond to labor market ne3eds in terms of entrepreneurship, high creativity, responsibility, discipline, morality, virtue, professional ethics, and honesty in an effort to promote development. The Royal Government is committ3d to achieving the goal of “Education for All” by ensuring equity in the attainment of nine years of basic education for all children and ensuring access by the children of the poor households to education, especially by improving the quality and number of public education institutions and providing more scholarships to poor students. The Royal Government will continue to strengthen its partnerships with the private sector and the national and international community to enhance and improve the quality of education services, both in vocational and technical training and in higher education, consistent with international standards and the development needs of the nation. The Royal Government will continue to increase budget expenditures, and mobilize increased international assistance to enable incentives for teachers, assure quality instruction; increase provision of education materials, equipments, libraries and laboratories; and build dormitories for students, especially female students; continue to reform curricula and training programs; provide scholarships to poor students; promote literacy and informal education programs; finance construction of schools in the rural areas and support school operating costs. As stated in Strategic Plan for the Health Sector 2003-2007, the Royal Government will increase the use of public resources and international assistance and continue to encourage the participation of the private sector to increase investment in the health sector that improves the health status of the people. Priority will be given to the construction of referral hospitals and health centers which can provide local health services in an efficient, equitable and sustainable manner to all citizens, especially the poor and vulnerable groups. The Royal Government will continue to focus on the implementation of prevention programs and combat communicable diseases and promote maternal and child health care to reduce the maternal and infant mortality, improve emergency services and provide health and sanitation education and information, especially in the rural areas. The poor shall be entitled to free health care in referral hospitals and health centers. Equity funds designed to help the poor in accession quality of health care services will be further strengthened and expanded. The Royal Government is strongly committed to the adoption and effective enforcement of health laws and regulations to ensure high quality health services, medicines and food safety. The Royal Government will continue to encourage the use of traditional medicines with appropriate information and control in conjunction with the use of modern medicines. Women are the backbone of our economy and society and the Royal Government has exerted its utmost efforts to improve the status of women through implementation of the Strategic Plan of Neary Ratanak or “Women are Precious Stones,” aimed at providing Cambodian women with value and hope in life, while promoting gender mainstreaming. The main objective of the program is to build the capacities of women and change social attitudes that discriminate against women. The Royal Government puts high priority on the enhancement of the role and social status of Cambodian women by focusing attention on the implementation of the Gender Strategy, capacity building for women in all sectors, changing of social attitudes that discriminate against women, and ensuring the rights of women to actively and equally participate in nation building. Indeed, all women have the right to health care, education and skill training. They are entitled to the equitable distribution of economic resources; equal opportunity to participate in socio-economic development, and equitable legal protection and thereby enabling women to avoid domestic violence and trafficking. Another important element is the substantive participation of women at all levels in institutions of governance. Cambodia’s population is growing at about 2.4% per annum, generating a continuing and heavy burden for production and job creation, which is barely able to cope with current needs. The Royal Government recognizes that the high rate of population growth increases poverty as it increases the burdens on family income, increases the ranks of the under-employed and unemployed, and contributes to the lowering of wages as excess labor is not absorbed by the economy. Moreover, high population growth increases pressure on water degradation and decreased bio-diversity. In urban areas, high population growth increases pressure on water distribution and sanitation and also worsens air quality. Moreover, high population growth has worsened the incidence of land-related disputes in rural areas and increased social problems in urban areas including high population density, proliferation of infectious diseases and the increase in crimes. · Consider population factors in all economic and social practices, plans and programs at all levels. In sum, the effective implementation of the population policy will enhance poverty reduction, especially toward the achievement of the Millennium Development Goals, which requires that each country reduces poverty by half by the year 2015. The Royal Government of Cambodia has devoted significant time and tremendous efforts over the past decades to rehabilitate and develop the nation from the ashes of genocide under the Khmer Rouge and protracted wars, until the restoration of full peace, political stability, law and order, democracy, respect of human rights and economic stability, which have been positively recognized, both nationally and internationally. The Royal Government has implemented reforms in all sectors, encountering enormous challenges, difficulties and obstacles. Since the mid-1980s we have made the transition from central planning to the dynamic market orientation, exerting sincere efforts to create the enabling environment for Cambodia’s rapid integration into the regional and world economy. 4. Promoting sustainable environmental management and use of natural resources. We reiterate that the Rectangular Strategy of the third legislature builds upon the achievements gained under the Triangular Strategy of the Second Legislature. Indeed, the Rectangular Strategy is the economic policy agenda of the political platform of the Royal Government in the third legislature of the national Assembly, formulated as a comprehensive, consistent, intertwined and mutually-reinforcing system,, which is easy to understand and implement. Indeed, the Rectangular Strategy is an effective policy tool of the Royal Government to implement the National Poverty reduction Strategy in the new mandate. The Royal Government recognizes that Cambodia still has a long way to go, and has to overcome numerous obstacles to achieve long-term progress and prosperity for the country and people. Thus the promotion of the harmonized efforts of the Cambodian people in poverty reduction continues as the most important objective of the Royal Government, as the third legislature of the National Assembly has come into office. Indeed, the Royal Government recognizes that poverty and all its aspects cannot be solved overnight, or in one month, or one year. However, with a well-designed program and sincere, harmonized and combined efforts and actions, the Royal Government will certainly achieve positive changes in enhancing the living standards of people within the next four years. I would like to reaffirm that reform programs that we have set out and highlighted now, are not meant to please anyone. It is the imperative of Cambodia to serve the interest of Cambodian people from all walks of life. I hope that after we walk out of this meeting, all policies and measures we have developed and addressed before the National Assembly and announced today will be translated into concrete action plans, aimed at bringing about fruitful results in all sectors. Especially, the outcomes will be explicitly reflected in the steady improvement and enhancement of the living standards of our people, which is the vital tool to measure the effectiveness of the Government’s work. In fact, for the third legislature of the National Assembly, we still have only four years to go, thus we really cannot take the normal track. We must make our utmost effort to successfully expedite the implementation of political platform, strategies, concrete reform measures, which we have laid out to the best interest of our nation and people. In this spirit, may I propose to the members of the Cabinet to consider this first Cabinet Meeting as the dedication of our physical force, intellectual energy and morality to the accelerated implementation of the comprehensive and in-depth reforms for the poverty reduction, progress, prosperity, and pride in the Kingdom of Cambodia. Finally, may I wish Your Royal Highness Sdech Krom Khun, Your Highnesses and distinguished Members of the cabinet, good health and great success in your joint endeavors within the next four years in your service for the Nation, Religion and King, the highest motto of the Kingdom of Cambodia. I would like to declare the closing of the Cabinet meeting.